Bharatpur (Nepali: भरतपुर) is a city in the central-southern part of Nepal. Located in Chitwan District, Bharatpur is the district headquarter of the Chitwan District, as well as a separate Metropolitan authority, and is the fifth largest city of Nepal, After Kathmandu, Pokhara and Lalitpur is also a one of the four Metro city of Nepal with the population of 2,80,502 (census 2015). Bharatpur is one of the fast growing cities of Nepal. It lies on the left bank of Narayani River and serves as a commercial centre of Chitwan district and central region of Nepal. It is located at the centre of Mahendra Highway and Kathmandu - Birganj (North-South) road corridor. The proximity of this city from Kathmandu (146 km), Pokhara (126 km), Butwal (114 km), Ghorahi (275 km), Birgunj (128 km), Hetauda (78 km) and Prithivinarayan (Gorkha) (67 km) has augmented the importance of its advantageous geographical location. In addition to good road access, Bharatpur has regular daily air services to Kathmandu and Pokhara. Most of the shopping area lies in the city of Narayangadh, while government offices, big hospitals and colleges are situated in other parts of the city, including Nepal's premier cancer hospital, B.P Koirala Memorial Cancer Hospital. The economy of Bharatpur was traditionally based on agriculture. The agricultural land is gradually converted into the residential and industrial areas. Main industries of Bharatpur are small scale processing industries. A large number of poultry industries have developed in the municipality. It is believed that it covers more than 60% of the total poultry demand of the country. Moreover, this metropolitan city has a substantial volume of poultry products for export trade. Other products of the city are honey, mushroom, floriculture, and service industry (education and health). Chitwan is regarded as food surplus district, which is processed in Bharatpur and sold to major cities of the country including Kathmandu and Pokhara. Besides, multinational companies like Coca-Cola, San Miguel Beer are also situated within the city. A large number of business and trading houses are based in the city. The major companies across the country have opened their branches in the city. Its central position along with the crossroads of Bharatpur has enabled it to increase its wholesale and retail trading function. Bharatpur has been declared Sub-metropolitan city on December 2, 2014 by Government with the inclusion of various local village development committee like Gitanagar, Fulbari, Sibanagar, Mangalpur and Patihani. The new population of new area according to population census 2011 is now 203867 . It has been declared metropolitan city on December 2016 incorporating some VDCs. Bharatpur Airport is in the central part of the city connecting to Kathmandu. Four domestic airlines and one government airline make 7 to 11 flights a day. Mahendra Highway connects the city to various parts of the country and another highway connects Bharatpur with Kathmandu to the north east and with Birgunj (Birganj) on the border of India to the south. Bus, Micro bus and other land transportation are available to go out of the city, for internal transportation city bus, city micro bus, taxi, rickshaw and car/jeep hiring is available. "Malpot Chok",Hakim Chok and Chaubiskothi, Shahid (martyrs ) Chok, Pul (Bridge) Chok, Bel Chok and Lila Chok are major centres at intersections of major roads. Communication: Many local FM radio stations broadcast from Bharatpur. They are "Kalika FM", "Synergy FM", "Hamro FM", "Radio Triveni", "Radio Chitwan", "Radio Kotagiri", "Kalika music FM", "Chitwan Online FM" and "Narayani FM". The city also has several Television channels; "BESO Channel", "CRYSTAL TV" and "AAVAS". Land line telephone services and mobile telephone services are available to the majority of areas. There are multiple private Internet service providers available within the municipality. Banks: Bharatpur has become a city of Banks and Hospitals. There are more than 40 Banks and Financial Institutions in Narayangadh (centre of Bharatpur). Bishazari Tal (20 Thousand Lakes) is in the southern corner of Bharatpur. The lake is very attractive for bird lovers and serves as an important bird watching centre. The lake area houses lots of crocodiles and thus is equally attractive for reptile lovers. The lake lies near Chitwan National Park. Bishazari Tal lies just 5 km south of the city centre (Chaubiskothi) of Bharatpur. Pandeyghumti is the nearest chok (square) to get to the lake easily. It is in the distance of 1 km from the chok. Nearby Chitwan National Park is home to one horn rhinos, elephants, royal Bengal tigers, crocodiles, deers and many other wild animals. It is the third largest tourist destination in Nepal after Kathmandu and Pokhara.Hotels of Bharatpur, Nepal and around Bharatpur . It has also been listed in the world heritage list since 2041 B.S. There are many large and medium-sized hotels and lodges near and inside Chitwan National Park. Some of them are Chitwan Village Resort (www.chitwanvillageresort.com), Royal Century, Naryani Safari, Chitwan Key Men, Jungle Resort, Jungle Safari and Tiger Top Tesort, Wild life camp etc. Chitwan National Park is also listed as a world heritage site. The Narayani River flows north to south in the west of Bharatpur. It is the deepest and also one of the biggest rivers of Nepal. The Narayani Bridge over the river connects Chitwan District with Nawalparasi District of Nepal. Small islands, like Nagarban in Narayani river are popular picnic spots. Rapti River flows east to south west in the south of Bharatpur and makes the northern border of the Chitwan National Park.in the rapti river we found gharial corcodile there and the biggest fish. Devghat- Devghat is one of the most holy places for Hindus and is located in ward no. 1, on the banks of Narayani and Kali river junction. Various caves and temples of Hindu God and Goddesses are located here. Devghat also holds a very beautiful natural attraction because of the two main and holy rivers. It is just 7 km from the city centre of Bharatpur. Tinkhole Monastery is one antique piece of art which makes Bharatpur as a land of diverse tribes. This Lamasery was made by Buddhist people as a symbol of piece and the interior design of this monastery reminds the meaning of life. Ganeshthan Temple (Baseni) is the most famous Hindu temple in Bharatpur and has a very long history. This temple is believed to be constructed by Muni Makunda Sen, King of Palpa in the 15th century, but the modern temple was constructed in 1952 in the period of King Mahendra. This temple is located in Baseni, ward no. 11. Every Tuesday people from different parts of the city visit this temple to worship Lord Ganesh. Bageshwari Temple - This temple located in ward no. 2, is also a very old one, believed to be built before Muni Makunda Sen and was renovated by yogi Narahari Nath . Is located in the Devghat area development district, but the area of Bageshwari temple is being used by Bharatpur medical college. Harihar Temple (Narayangadh)- Harihar is another name of Hindu God Bishnu. This temple is on the banks of Narayani river. Mahakaleshwar Shiva Mandir (Bharatpur -10)- This temple is the only temple of lord shiva around this locality. This temple is made with many antiques. Along with temple it has 108 shiva linga, havan kunda, hanuman statue, satsang hall, ganesh temple and under construction gauri kund is also present in temple peripheri. Kalika temple- Kalika is one of the very powerful Hindu goddess, this temple is in Bharatpur height. This temple is relatively new, built about 15 years ago. Jakhadi Mai Temple (Baseni)- This temple is on the eastern corner of the Jungle in ward no. 11 and was constructed around 25 years ago by the locals. Durga Temple (Baseni)- Durga Temple was built by the police force within the compound of Police Academy, Bharatpur in 1992. Pashupatinath Temple (Mahendra Buspark) Bharatpur- This new temple is on the banks of the Narayani river with very beautiful scenery of Narayani and northern Jungle of Devghat Region. This temple has all the facilities for wedding ceremonies and other religious purposes. Upardanghari fort:- It is in the old headquarters of Chitwan district and is believed to be made by Satrubhanjan Shah, son of Prince Bahadur Shah to defend newly founded Kingdom in the 17th century. It is located on the top of a hill and overlooks a very nice natural scenery. Kasrra Durbar(Palace):- Is an old palace made by Rana Regime inside the Chitwan National Park. Now it is being used as an office of National park and also hosts a museum. Diyalo Bangala Palace (Aptari Bharatpur):- This was the spring season palace used by the Shaha Dynasty of Nepal. This palace was built by late king Mahendra to rest during winter season. 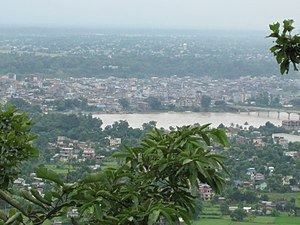 It is located on the banks of Narayani river in ward no. 2. DAO Building Bharatpur :- This long and attractive old building was built in the period of shifting the headquarters from Upardanghadhi. Now is used as an office of chief district officer. Bharatpur Covered hall:- Hall in guesthouse of Bharatpur for indoor games. Bharatpur Government Hospital (formerly known Mahendra Adarsh Chiktsalya) -is the most busiest and the second large Government Hospital (after Bir Hospital Kathmandu) operating with more than 700 bed capacity, this hospital was started by the American aid during the malaria controlling program operated by the US government on the request of let king Mahendra of Nepal . College of Medical Sciences (CMS) Teaching Hospital - Affiliated to Kathmandu University, this is the teaching hospital of with 700 beds. It is providing all sorts of medical services to the locals, occasionally treating them. Chitwan Medical College (CMC) Teaching Hospital -Affiliated to Tribhuwan University,this new hospital is in the heart of Bharatpur-10, Chitwan. This hospital is providing all types of medical facilities. Bharatpur Eye Hospital - This hospital is also located in Dipendranagar. With 25 bed capacity, it provides all type of services related to eye problem. B.P. Koirala Memorial Cancer Hospital - This hospital was established with the help of the Government of People's Republic of China in 1994, with all cancer treatment facilities this is the meager cancer treatment institution in the country. This hospital is named after B.P. Koirala, the democratic leader and the first elected prime minister of Nepal.This hospital is situated at Krishnapur, Bharatpur. Narayani Community Hospital - This is a relatively new hospital and is located in the heart of the city, Chaubishkothi with 150 beds. Other important hospitals and nursing homes are Niko Children's Hospital, Asha Hospital, Manakamana Hospital, Janasewa Hospital, Chitwan Hospital, Bharatpur Community hospital Pvt. Ltd., Om Hospital, Lok Sewa Pharmacy, Shanti hospital etc. Narayangadh (Nepali: नारायणगढ) or Narayanghat (Nepali: नारायणघाट)) is an important trading centre in the centre of the city. The major neighborhoods of Narayangadh are Shahid Chok, Pulchok, Kshetrapur, Belchok and Milanchok. Narayangadh is very famous for "Taas", a spicy fried goat-meat lunch dish served with Bhuja or Cheura. Narayangadh has extremely hot summers but very mild winters. Bharatpur Airport in the central part of the city offered four domestic airlines and one government airline with seven to 11 flights daily to Kathmandu. Mahendra East West Highway connects the city to various parts of the country, and another highway connects Bharatpur with Kathmandu to the north east and with Birgunj on the border of India to the south. Bus, micro bus and other land transportation are available to go out of the city, for internal transportation taxi, rickshaw and car/jeep hiring is available. Hakimchok, Shahidchok, Pulchok, Belchok, Malpotchok, Bishalchok and are major centres at intersections of major roads. Eight major local FM radio stations broadcast from Bharatpur. They are "Amrit FM", "Synergy FM", "Hamro FM", "Radio Triveni", "Radio Chitwan","Chitwan Online FM" "Kalika music FM", "Kalika FM". The city also has Beso Channel, "Aviyan Channel", Unique Television and Avass Television.